I was in fifth grade on the day of September 11, 2001. Like most fifth graders, the day of school began with thinking about how recess would go, what I would have for lunch, if I’d have any homework and when I could see my friends after school. It ended totally differently. There is no other day of school in my life I can remember this vividly. My teacher, Mrs. Mains, asked the class if any of our parents worked in New York City. I raised my hand. From a very young age, I recognized how special and how different New York was from every other city in the world. I would go to New York regularly with my dad. About three or four times per month, we would take the train into the city and I always remember the excitement of going there. I loved it. We went for various reasons. Sometimes we went to see the New York Mets play. Mostly, though, we went because I was born with a cleft lip and palate, and that’s where my doctor was. After each trip to the doctor’s office, we would walk to the Second Avenue Deli. Even with all the people in the city, our waiter there knew our names. Those times were special and I will always cherish them because I got to spend them with my dad. I remember being so excited to tell the class that my dad worked in the World Trade Center. Growing up, that was what I was most proud of. In the greatest city in the world, with all of its famous sites, my dad worked in one of the Twin Towers, the most famous set of buildings. I said the words “Twin Towers” to my teacher and her face turned to horror. I never will forget that look. I am forever grateful that my father was not working in New York that day. But there are so many others that weren’t so lucky. Living in New Jersey with friends and family all over New York, I know people who had their families ripped apart. Their lives were totally changed that day and I know if it still affects me, it must still affect them. 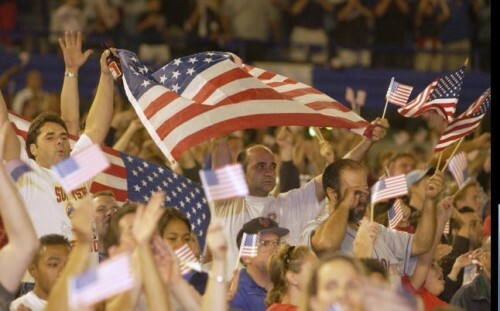 I think with what happened, we learned how important sports were in our country’s slow return to normalcy. There was one baseball game that seemed begin the healing process for everyone. 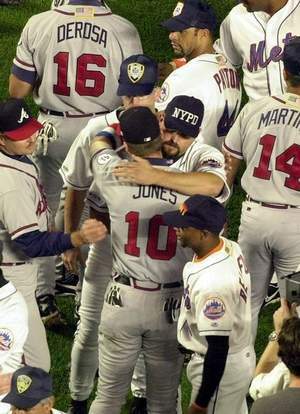 The Mets hosted the Atlanta Braves at Shea Stadium on September 21, 2001, the first game played in New York City since that dreadful day. The crowd that night wasn’t sure how to act. The emotion was still pouring out of the city’s open wound. In the bottom of the eighth inning, Atlanta led by a score of 2-1 and brought in set-up man Steve Karsay, who got the first batter, Matt Lawton, to groundout to shortstop. Karsay then walked Edgardo Alfonzo and Desi Relaford immediately entered the game to pinch-run. The next batter was Mike Piazza. Piazza took strike one before launching the next pitch over the center field wall to give the Mets a 3-2 lead. It took just one simple swing of the bat to send Shea Stadium into a frenzy. 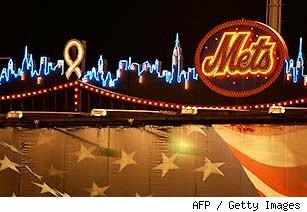 The home run was a sign telling not just Mets fans, but the city of New York, that it was okay for the country to begin healing. Mike Piazza smashed 427 homers during his 16-year career. None were more important than that one. This entry was posted on September 11, 2011 by Scott Kornberg. It was filed under Mike Piazza, New York Mets and was tagged with 9/11, Atlanta Braves, Braves, mets, Mike Piazza, Mike Piazza home run 9-21-11, New York Mets, Scott Kornberg, September 11, September 11th, Shea Stadium. Not a great headline, but that was a fantastic post. Great stuff.